Posted in Bright Ideas / Research on November 9, 2018. The mobile-first index should have come as no surprise to local businesses. Google announced its plans for mobile way back in 2016, and its slow rollout has given businesses plenty of time to adhere to the new expectations. In July, many local businesses received notifications that mobile-first indexing was now enabled for their sites. And with Google’s John Mueller confirming once and for all that you cannot opt out of mobile-first rankings, it’s absolutely vital that websites are optimized for every device. Now that everyone’s had time to get used to the new ranking parameters, we wanted to find out what this change has meant for local businesses. A huge thank you to the 400 people who answered our poll. Are the sites you manage optimized for mobile? 73% of respondents told us that their sites, or the sites they manage for clients, are optimized for mobile. While the vast majority of these sites were optimized ahead of the switch, a small proportion have made the changes since. Better late than never! 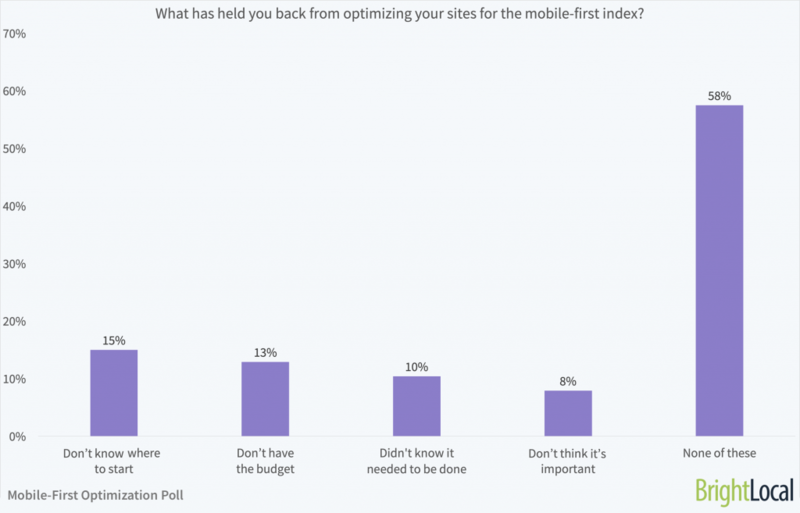 A significant number of respondents told us that their sites aren’t mobile-ready, with others not being sure. Google developed the super-handy Mobile-Friendly Test to analyze if your pages are easy to use on mobile, and to show what your site will look like. How have rankings changed for the sites you manage? Interestingly, 43% of those polled weren’t sure whether they had seen ranking changes since the update. Of course, it can be difficult to attribute changes to specific causes (especially as the last few months have been so tumultuous). To keep track of your business’s rankings, you can sign up for a free BrightLocal trial. 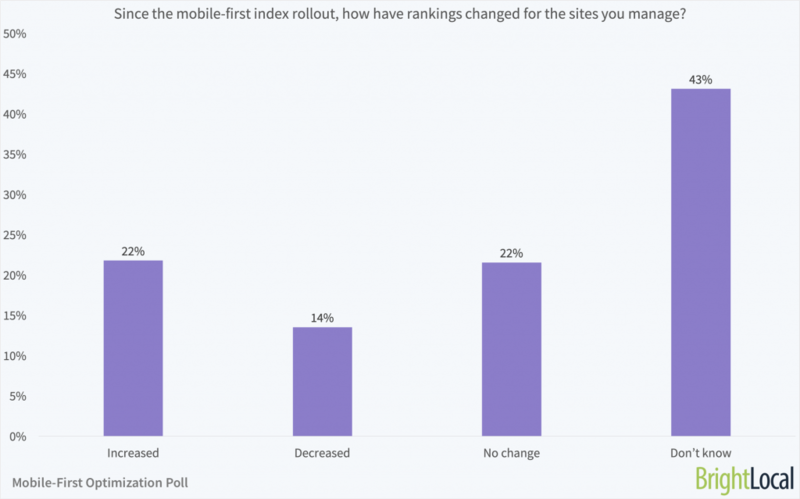 Since the mobile-first index rolled out, 36% of the remaining respondents saw a difference in rankings – with more seeing a positive increase than those experiencing losses. Businesses that do not ensure their sites are mobile friendly risk ranking drops. The 44% of respondents who saw increases or saw no change are likely to be meeting Google’s expectations. What has held you back from optimizing your sites? We asked our users to share the challenges they’d faced optimizing their sites for mobile. While more than half of respondents didn’t face any issues, there are a few problems holding businesses back. 15% of respondents told us they didn’t know where to start optimizing their sites. If you are confused too, start with Google’s best practices, and if you need more help, Jamie Pitman shares his top tips here. The second most cited challenge was local businesses’ lack of budget. We know that it can be difficult to spare cash for website changes, but if businesses want to be seen on Google, they really will have to put budget aside for mobile optimization. It’s by no means a certainty that websites will need to make major changes, but with 27% of consumers looking online for a local business every day in 2018, businesses need to ensure they can be found. 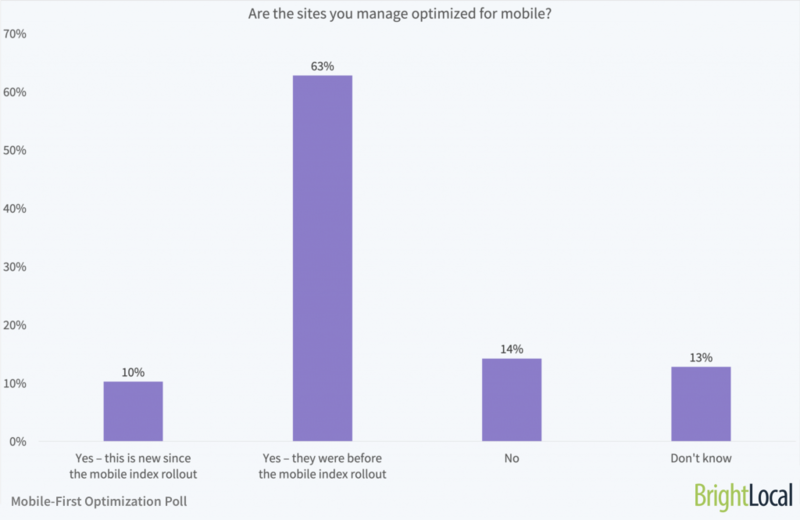 A worrying 10% of respondents didn’t know their site needed to be optimized for mobile. This awareness may be skewed by the fact that the poll was made up of BrightLocal users, who are likely to be more informed of mobile requirements, so the overall proportion of local businesses unaware of the necessary changes could be far higher. 8% said they didn’t think it was important. I should reiterate here that Google now prioritizes sites that are usable on mobile devices in rankings whether results are appearing on mobile devices or not. Not being mobile friendly may not automatically tank your rankings, but would you risk it? Despite the advance warning from Google, many local businesses are still in the dark about the mobile-first index. Has it affected the sites you manage? Let us know in the comments below.